Wireless charging isn’t anything new, especially when we’re increasingly seeing phone manufacturers incorporating the system in many of today’s popular phones. Naturally, you gain the cool factor when you can actually show off the feature, but if you’re holding a device that doesn’t particularly offer it, the EzyCharge from the company Droidax aims to remedy things for you. At the heart of it all, the EzyCharge features a base station that provides the comfort of wireless charging. There’s nothing to the design, since it’s just a flat board that’s constructed out of glassy plastic, which is prone to smudges and fingerprint. However, the beauty in it is found in the way it’ll wirelessly charge your device. Although it’s only able to accommodate a single device, the LED lights at the head of the EzyCharge will turn blue initially to indicate a connection – then red, to show that it’s actively charging. Aside from the included battery case for the Samsung Galaxy S III, the EzyCharge is compatible to work with any other thing that utilizes the Qi standard. As for the other part of this kit, the battery case for the Samsung Galaxy S III, there’s no arguing that it amps the overall size of the smartphone – then again, it’s worth mentioning that it’s a case and battery pack rolled into one. Specifically, it’s packing along a 1,200 mAh battery, which is something that’ll top off the handset, but nothing to the point of fully charging it back from a drained position. Sure it’s bulky and weighty, but we do like how it’s sporting a soft touch finish and a solid construction. Needless to say, wireless charging is a pretty neat thing, even more when you actually have devices that are enabled for it. 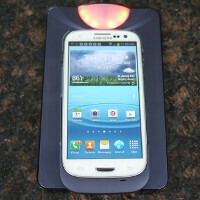 With the Droidax EzyCharge, it’s nice that it comes bundled with the base station and a battery pack case for the Galaxy S III. However, it’s not known if it’ll be bundled with other battery pack cases for some of today’s highly prized smartphones. Nevertheless, it’ll work with ANY device using the Qi standard. Normally, it retails for $80 online through Droidax’s web site, but between now and the end of July, it can be purchased for $50. Seriously, that’s not too shabby considering what you get.